The Hunter Model Series 2101, is a fully automatic single track (intermittent motion) rotary filling and lidding machine designed to handle a wide range of stackable (round or rectangular) tubs, generally up to 1 kg or 1 litre capacity. A wide range of container sizes (up to 140.0mm max dimension) can be accommodated by the use of change parts - change over time is usually no more than 15-20 minutes. Outputs up to (and sometimes exceeding) 60 containers per minute are achievable depending on product type and container size. 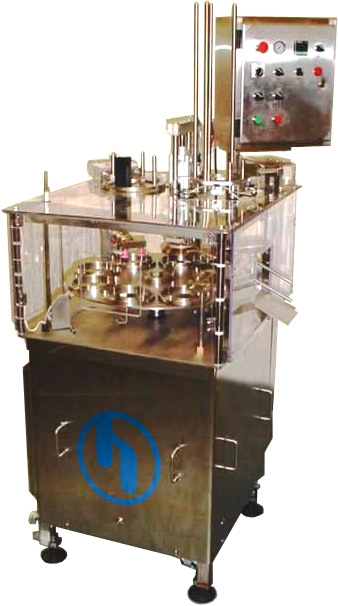 8 station rotary indexing machine for filling, sealing and lidding round or rectangular tubs. Containers up to 150.0mm across many accommodated up to 1kg capacity. Up to 60 tubs/min filling and lidding. Up to 35 tubs/min filling and heat seal membrane. Microprocessor (PLC) control of all functions ensures exceptional reliability. Systems often incorporate Hunter volumetric fillers (Model 305 or Model 505). An optional bottom-down fill (container lift), at 2 filling stations. Standard, no container /no fill and container/no lid feature. Safety guarding and interlocks to the appropriate standards. Change parts available for different sized containers and lids. Ejection of containers to optional outfeed conveyor and collating table. Stand up pouch version available for filling and sealing of gusset type bags.